Auto arm capable. When activated locks out brew cycle until optimum temperature is achieved. Description: This tried and true brewer is for offices that want a traditional brewer for pre packaged fractional pack coffee or who use it in conjunction with a whole bean grinder. 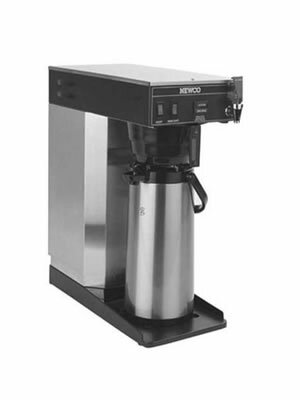 This coffee brewer workhorse for any office of any size. Recommended system for traditional coffee brewers over the glass pot systems as the coffee stays hot in the insulated thermal pots without burning like the glass pot systems do.